If you are here, chances are you're interested in seeing what Bungee Safety Consultants (BSC), a professional team of bungee-experts, has to offer. There are many different options available for establishing a jump site in your city. 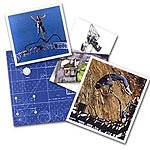 The options listed below are meant to offer some insight into the scale that Bungee Safety Consultants can achieve. Working closely with each of our clients, we determine exactly what their needs are, specifically tailoring our existing options to meet the requirements of the client and the location. Able to supply everything or just selected components in the development of a bungee business, we ask a number of questions in order to determine how we may assist our clients with a bungee-jumping site. As we are sure you would expect, the price of the various packages shall be determined by the height of the structure, type of jump platform, the number of options selected, amount of equipment needed and requested, miscellaneous supplies and the amount of expertise (management/training time) that BSC furnishes to your organization. 1. The "Las Vegas Casino Dream Tower!" Our most famous tower design. Built in 1991 and still a major draw on the Las Vegas Strip, this has been one of the most profitable jump-sites ever built. This 50-meter, six-in-one structure gives the operator the ability to offer patrons several extreme options, allowing the widest market of customers at your one location. With three different high-energy "Extreme Adrenaline" rides and one children's ride all in one structure, your site will have a lot of action to offer customers. 4. The Budva-Beauty automatic bungee system! This clean, single-elevating jump platform could be the all-inclusive operation your company needs. The MBS Arch is a two-in-one structure with the ability to switch between bungee jumping and reverse "ejection" bungee launching. World-famous 23-meter Titan T-Tower design with two air bags allows for maximum extremity in a minimal amount of space. Featured on EXPN's X-GAMES, this fifty meter L-Shaped tower comes with the option of an installed elevator. This classic bungee site design features one platform and one airbag. This option requires an existing building or a pre-fabricated tower. Need expert training for your Bungee Crane? Our team will deliver with the gear and technology to train you and your employees. Prepare yourself and your crew with professional training by Bungee experts!